I want a wreath on my door. People in my neighborhood have nice wreaths, and I get a little jealous when I am driving through. Total #DoorEnvy. I tell myself that we’ve only been in our house a few months and we still have a lot of settling in to do. So a wreath is low on the priority list for now. In the meantime, I live vicariously through this blog when it comes to crafting decor ideas. For this week’s project, I used a unique grapevine wreath and dressed it up two different ways! Let me know what you think in the comments! When you picture a wreath you probably think of lots of different kinds of wreaths like floral, twig, pip berry, pine, fabric, etc. I bet the one thing they have in common is that they are circular. We are jumping outside of the circle today and using an oval shaped grapevine wreath! This particular wreath is handmade in the USA! KP has tons of wreaths but I wanted my base to be neutral so that it would be easy to dress up for two different occasions. Grapevine was definitely the way to go. The branches are strong and sturdy, and it easy to weave different florals into it. Don’t be afraid to go nontraditional in your decor! 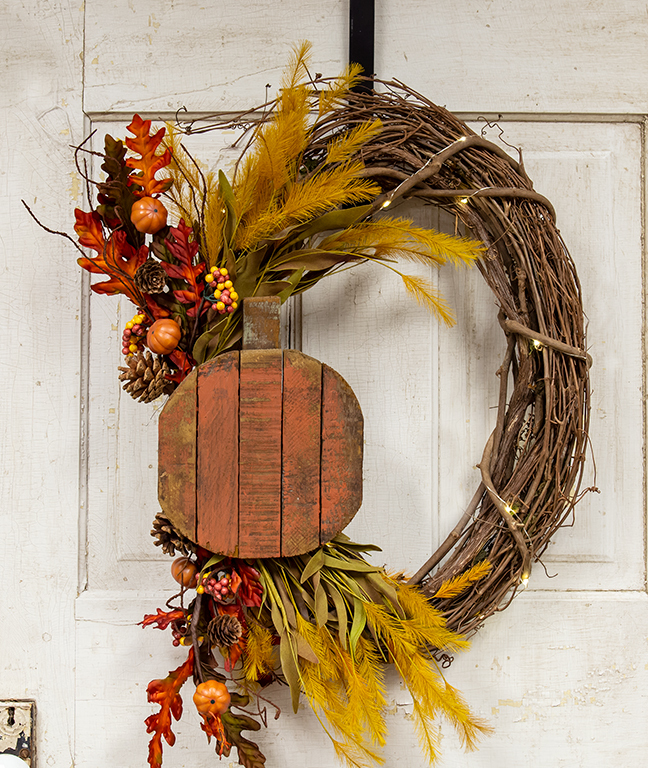 This wreath is easy to put together and perfect to leave up all fall. The warm oranges, reds, and yellows will give your home a nice welcoming vibe! The yellow dog tail grass bush is probably my new favorite fall floral. I like the feathery texture it adds! I used two dog tails and two harvest leaves sprays. Fluff them out and make the arrangement as full as you want! I also wrapped some bud lights around the wreath to follow the path of the thick grapevine that binds all the smaller branches together. A+ decision if you ask me! I am always a fan of a little twinkle! I will say that I had a little trouble= securing the lath pumpkin to the wreath. There is a wire hanger on the back of the pumpkin but the branches weren’t positioned in a way that I could attach it near the florals. So I ended up using a thin wire to secure the pumpkin. When there’s a will there’s a way! My tip to you is to assess the wreath a little more before you place your florals. Think about how and where you want to attach the pumpkin. The wreaths are handmade in the USA, so they will vary slightly, and yours might end up with easier access to a branch! Place your florals around that spot so you can attach your pumpkin easily. I had already placed my florals and I didn’t want to reposition them. But the wire works just fine! Glad I had a backup plan! Let me know what worked best for you to attach the pumpkin. This is a fun one! I used the same oval wreath and changed the motif to Halloween. Put this one up for all of October (or beyond if Halloween is your thing!). The ornaments were super easy to position and attach to the grapevine branches. And isn’t the mummy ghost the cutest?! You can see little eyes peeping out through the “bandages,” and the hanging, tattered strips of cheesecloth, make it one of a kind! I put him dead center as the focal point of the wreath. The ornament’s jute cord was easy to tie around one of the branches to keep him in place. I couldn’t pass up the goofy grin on these spiders! I wanted to add more but I made myself stop at three. Add as many as you want though, go wild with the “creepy crawlies!” To curb the urge for more spiders, I added spooky grungy bats. You get two bats in a set; one small one and a bigger one. They are heavily dusted in a cinnamon coating for an extra grungy look. There are a total of four maple and berries picks to add a burst of golden yellow and orange to warm it up. They add contrast to the wreath since all the other colors are neutral. 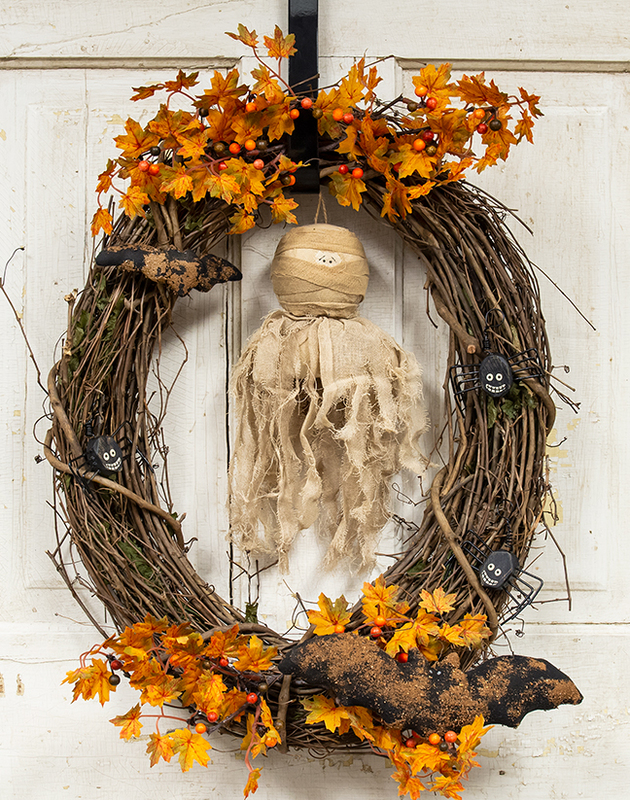 Trick-or-treaters will love being greeted by this festive wreath! Finding a great neutral base is important in order to get longevity out of your home decor. Think buckets, milk cans, bike wheels, and more. Find something that can change with the seasons in a few simple steps. Tell me, What piece of versatile decor do you own? You will get exclusive emails and insider info from me! Don’t miss out! He has just the right amount of cinnamon grunge! Thank you! The florals are my favorite on that one! Have not been able to access your site. Safari says too many redirects. HELP!! Love your site!! Go to settings on your internet browser > advanced > privacy and security > clear browsing data > make sure that “cookies and other site data” is checked. Then clear. This can vary slightly depending on the browser you are using but this is a good base of what you are looking for. Hope this works and I hope to hear back from you soon!